In a country known for its beaches and its beach culture, we are completing the ultimate journey on the wild northeastern coast of Brazil. Using 4-wheel drive vehicles and our knowledge of the tides, we will complete a route connecting the surrounding remote villages. This area of sand dunes, warm green waters and wild, beautiful coastlines is one of the most appealing natural areas in all of South America. 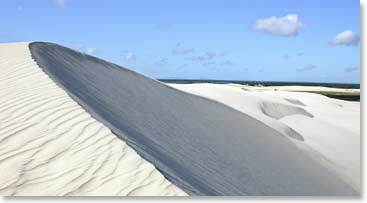 In addition, we will explore the unique Brazilian culture and uncover the beauty in the Lencois Maranhenses National Park. October 8, 2008 – Amazing Photos From Our Brazilian Adventure!